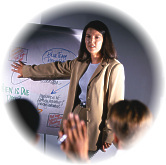 Time Superstar™ is TSOD’s popular time management training program. This highly interactive half-day experience reveals proven best practices for professional effectiveness, then lets your team “test drive” their new insights through creative brainstorming exercises. Your team members will benefit from the latest research on time management, customized by and for your team. This is one of our most popular ”repeat customer” programs, for a very good reason: Saving just twenty minutes a day adds-up to two weeks of new opportunities each year. TSOD’s half-day Success Under Stress™ Training Program includes everything you’ll need to implement a healthier, more productive lifestyle, at home and at work. Beginning with an exploration of worry, anxiety, and tension, you’ll learn both the positive and negative aspects of various stress categories. By graduation, you’ll have mastered more than 24 proven techniques for mitigating stress, and you’ll have identified methods for coping with conflict, change, and deadline pressures. After you’ve reviewed the online resources, get in touch to discuss the training opportunities available to your team. TSOD’s instructional designers engineered these courses to ensure that you and your team gain the maximum benefit. First, you’ll enjoy training as a team and reaching conclusions as a team. You’ll profit from a customized learning experience that unveils new opportunities for your group to work smarter and more effectively. And by the end of the course, you’ll see a boost in camaraderie, as well. Also, you’ll find the experience uncommonly respectful of your time. If you’ve ever snickered at the thought of a two-day time management course, you already understand our commitment to making these courses as streamlined and content-rich as possible. Finally, you’ll benefit from courses that, in their third generation, were test-driven by some of our most demanding customers. The result? A resounding—nearly overwhelming—seal of approval. The programs are available—either together or as standalone workshops—at your location, for your team, anywhere in the United States. You’ll always benefit from our fully bundled tuition rates, which ensure that your costs are reasonable and predictable. We never add fees for instructor travel, expenses, participant materials, or other variables. Each of the workshops is a half-day in length. The time management program lasts a very full half day, which we recommend scheduling in a four-hour timeframe. The stress management program is well suited to a three-hour timeframe. Scheduling onsite training from TSOD is push-button easy. If you’re in the information-gathering mode, we invite you to explore the online resources about these courses. Our exclusive Course Datasheets provide at-a-glance facts and clickable links for deep details on both programs. Scroll-up to access the Course Datasheet links. When you’re ready to talk about course scheduling, you can review frequently asked questions and get in touch through our Workshop Scheduling page. And if you’re ready to schedule, you can receive a Service Agreement by fax through the Express Scheduling page. We look forward to bringing these high-quality team development experiences to you! Contact Us for Your Team Workshop!